Coca-Cola's mobile initiative is expected to drive interest and awareness from other brands to invest in mobile. But there are still challenges to overcome. The classic 1970's song from the Who titled "Going Mobile" could very well be the catch phrase these days for many companies that are quickly realizing that innovative, out-of-the-box mobile video campaigns cannot only help generate sales but can also increase brand awareness and capture customer loyalty. "With the move to new media and phone-based content, the race is on between leading brands to create a vehicle for advertising that works in these new environments," said Rob Enderle of The Enderle Group, a market research company. Enderle said that Coke's strategy for two recently launched mobile video campaigns (Sprite Yard and Bottle Films) is a work in progress. "They're applying a variant of the strategy that was successful on TV, but embracing the power of the more interactive cell phone platform," he said. "We're very close to the birthing moment for this strategy, and not everything Coke does is likely to be successful." Still, Enderle noted that properties like Sprite Yard show a substantial amount of promise as the industry moves to new formats and platforms like cell phones that could eventually replace the old. Teens, for example, live off their phones, especially in countries like Japan and South Korea. This creates a problem for traditional advertisers that don't want to lose touch with potential buyers. Coke, Enderle added, may thus establish itself as the company that did cell phone media right and embarrass companies like Apple who should have gotten this right first. Many consumer packaged goods (CPG) companies are already doing mobile video promotions, although for each brand it's different. "They have to do what makes sense for the product and their target audience," said Julie Ask, vice president/research director for JupiterResearch. "Our research also shows that about one-sixth of cell phones have full video capability today. I like the idea of mobile videos, provided they load quickly and are created for the small screen, since it's hard to do branding on a 2" x 2" screen." And the bottom line? Mobile marketers need to break the mold; it's not just about the brand anymore. "It's about how well marketers give consumers what they want, the overall consumer experience they create, not just product push and pull," said Joel Parent, director of interactive business development for promotion solution provider IC Group. Mobile advertising doesn't work in a vacuum, and probably for the next few years, it will remain a complementary channel that is part of an overall brand strategy. But there are challenges to overcome. Yaakov Kimelfeld, vice president and digital research/analytics director at MediaVest, which implements brand-building campaigns and solutions, said today's mobile web is still limited. Barriers include poorly designed WAP sites, limited interaction options and slow and costly data transfers. "Mobile ad delivery is not yet centralized and there's still no third-party serving mobile," he said. "There are also too many technology approaches (XHTML, Java MME, FlashLite, .NET Compact, et cetera) and issues such as which browsers and mobile devices the new site should be optimized for." Kimelfeld added that mobile marketers also don't have enough tools to evaluate and compare WAP sites side by side. "Data from mobile measurement leaders is not yet granular enough to be useful for campaign planning," he said. "More often than not, a planner learns about relevant sites from word-of-mouth and vendor outreach and has no hard numbers to rely on." Margaret Clerkin, CEO of North America MindShare Interaction, added that traditional creative agencies are not all up to speed in the mobile arena. "The burden falls on the media agency to put together a roadmap for mobile development, including locating creative development partners, ad inventory, ad serving, research, analytics and more. Unfortunately, one-stop shopping for mobile services is limited," she said. Anyone with a WAP-enabled phone can download and share pictures, interact with friends via text messages, get exclusive information and use a planner. 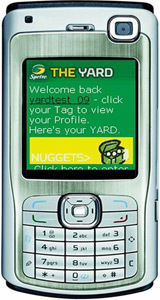 In the United States, for example, consumers text "YARD" to 59666 ("Lymon") and receive a reply with a WAP link to access the Sprite Yard for the first time. Clicking the link directs the mobile device to the "Yard" where users register by selecting a tag name and password. Once registered, they can create a profile to share with others. Sprite Yard also offers free downloadable content, "visitones" (visual ringtones combining music with visuals) and "mobisodes" (animated shorts), both unlocked through a PIN found under the cap of every 20 oz. Sprite bottle. "The brand becomes the enabler of mobile social connections," said Mark J. Greatrex, senior vice president of marketing communications at Coke. "The Yard users literally have their friends in their pockets." But Greatrex also acknowledged that Coke needs to integrate mobile into all of its marketing endeavors. "We need to explore how mobile marketing can drive impulse purchases at point-of-sale," he said. Coke's click-to-video campaign, designed to reach consumers in more than 160 countries worldwide, was created by AdMob, a San Mateo, Calif.-based mobile advertising company. The key objective was to engage their customers on carriers and handsets worldwide, using rich content from Coke's Bottle Films, consumer-created 15 to 30-second videos of what the company calls "The Coke Side of Life." The videos can be seen at http://www.coca-cola.com/. According to AdMob CEO Omar Hamoui, discussions with other agencies and companies revealed an overall advertiser need for pages to which they could drive traffic and leverage mobile services. So AdMob decided to build a landing page tool for its advertiser customers and approached Coca-Cola about becoming a beta partner for this and a click-to-video solution. "Coke wanted to reach customers in a controlled fashion while simultaneously testing and learning more about the effectiveness of text and banner ads in the mobile environment," Hamoui said. "Advertisers are recognizing they need a site for delivering traffic, but at this stage of the mobile internet, many of them don't have effective landing pages in place." A robust, self-serve landing page tool was created to handle all of the above. The tool offers a modular configuration of landing pages with a drag-and-drop mechanism, allowing advertisers or their agencies to upload images, logos or video in addition to text drafting and formatting capabilities. Advertisers can create hosted xHTML landing pages without needing to write any code. Although a team of engineers worked for almost three months to build the platform, a single AdMob graphic designer completed the Coca-Cola landing page in just a few hours. Prior to launch, alpha testing was conducted with AdMob's video partner, MyWaves, a Sunnyvale, Calif.-based mobile video company, and additional copy, creative and usability tests were performed. MyWaves provided the video delivery capabilities, a critical component, as there are literally hundreds of handsets in the market, all with varying media capabilities, screen sizes and network connectivity. MyWaves stored, streamed and downloaded the video, all necessary click-to-video ad elements. The Bottle Films shorts are presented to users as they browse mobile web pages. If they click on the ads, they are taken to another mobile web page that shows the first frame of the video as a still. Users can also send the video to a friend. "No ads are pushed to the user at all," Hamoui said. "If a user clicks on an ad, he will be delivered to a mobile web page. From this page, he can choose to view the video, download it or send it to a friend." Results thus far are promising, Hamoui said. AdMob tested the Coke ads across its worldwide network, and the ads ran in 160 countries. They also achieved a clickthrough rate of 1.37 percent. "Perhaps most interesting was the 1.3 to 1 ratio of actions to click, meaning that the average user that clicked on the ad watched the video more than once," Hamoui said. The demographics on mobile browser usage seem to support this. Market research from Telephia and M:Metrics show an almost equal distribution of male-to-female users and a healthy distribution across age groups. "As on the traditional internet, banner ads enable brand advertisers to reach users on their mobile phones," Hamoui said. "Click-to-video ads should be relevant to any advertiser who has had success with video ads in other media. Direct response advertisers might also be more inclined to drive a user to a purchase action rather than a video." Third Screen Media rolled out a mobile ad campaign for Unilever, one of the largest consumer brand companies worldwide, that featured actor and romance cover model Fabio. The "I Can't Believe It's Not Butter" mobile initiative featured a WAP site that closely mirrored the brand's Kitchen of Love online counterpart, also with Fabio. The site enabled users to download video content, send "Fabio-grams" to friends and view recipes provided by Unilever. Proctor & Gamble launched its "Irresistibility IQ for Crest Whitening Plus Scope Extreme Toothpaste" mobile campaign, which featured Nick Cannon, host of MTV's "Wild 'N Out." The mobile program for Crest ran on all major U.S. wireless carriers and was the first of a series of campaigns for P&G brands using integrated short message service messages (SMS). To take the Irresistibility IQ, quiz users texted "IQ EXTREME to C-R-E-S-T." P&G said response rates were high. McDonald's franchises near Tulsa, OK, developed "Mobile Whoa," a campaign that offered consumers mobile coupons, an SMS scavenger hunt and a mobile phone picture gallery. To join the hunt, participants had to text "Hunt 62931" or go to the website. Clues were revealed until someone solved the mystery. The coupons, called mCoups, offered a free small order of fries or hash browns. People who uploaded photos could access a mobile phone picture directory, ringtones and wallpapers. Informa Telecoms & Media predicts that mobile ad spending will exceed $11 billion annually by 2011, as more and more CPGs migrate content to the mobile phone screen and carriers continue to foster partnerships with major brand advertisers and media companies. Laura Marriott, president of the Mobile Marketing Association, which has representation in more than 40 countries and strives to stimulate the growth of mobile marketing and its associated technologies, sets guidelines to ensure consumer opt-in or consumer pull in all mobile marketing initiatives. Marriott said that brands are beginning to build significant investments around the mobile channel. "Coca-Cola's launch, for instance, will help drive interest and awareness from other brands to invest in mobile," she said. "Large-scale campaigns by companies like Coca-Cola are another industry milestone in that brands are leveraging the mobile channel to its fullest potential. The fun has only just begun." OgilvyInteractive's Maria Mandel added that the ultimate success of mobile marketing boils down to what consumers want to receive on their mobile devices and in what form. She envisions a number of upcoming trends such as advertisers that will invest in mobile as a separate channel and tag traditional/event media with short-code response/promotions. "There's no question this is a multimillion-dollar opportunity for advertisers," she said. "The challenge is to figure out how best to leverage it."